Freshen Up Your Plate & Lighten Up Your Heart! It’s time to buckle down and freshen up your lifestyle after 6 weeks of holiday eating! Fish is a fantastic high-quality protein that will easily fit into a healthy lifestyle. Our stores offer a variety of fresh fish that is easy to prepare and a delicious addition to your dinner rotation. The American Heart Association® recommends eating fish (particularly fatty fish) at least two times (two servings) a week. Each serving is 3.5 ounce cooked, or about ¾ cup of flaked fish. Fatty fish like salmon, mackerel, herring, lake trout, sardines and albacore tuna are high in omega-3 fatty acids. Research studies have shown that omega-3 fatty acids decrease risk of arrhythmias (abnormal heartbeats), which can lead to sudden death. Omega-3 fatty acids also decrease triglyceride levels, slow growth rate of atherosclerotic plaque, and lower blood pressure (slightly). 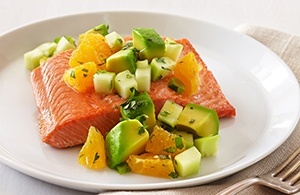 In a medium bowl combine avocado, lime juice, orange, cucumber, onion, jalapeno, cilantro and 1/4 teaspoon of the salt; set aside. Season salmon with remaining 1/4 teaspoon salt. Arrange fillets on a lightly greased foil-lined rimmed baking sheet. Broil salmon 4 inches from heat source until cooked through, approximately 10 minutes. To serve, place fillets on a platter; top with salsa.